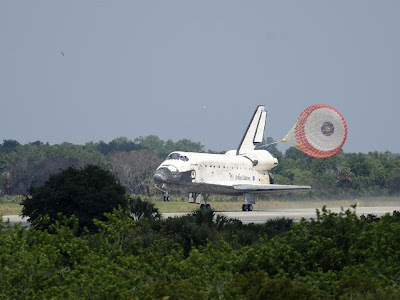 This morning in Florida, at the Kennedy Space Center, Mark Kelly and his crew landed the Space Shuttle Discovery--ending an almost fourteen day mission to the International Space Station. This was Mark's third mission. I met him between his first and second, but followed this mission the closest. NASA names the missions using the official shuttle name "Space Transportation System" and a number. This was STS-124. Even though I've known Mark for a couple of years, and personally know other astronauts as well, it wasn't until he invited me to the Kennedy Space Center for his launch that I really focused on the shuttle, and for the first time in my adult life, thought much about America's space program. Our space program is an emblem of American pride. It epitomizes the can-do attitude of the United States. Far too many of us just take it for granted, but every time a shuttle or any rocket is launched, it's a major accomplishment and a reminder that we are living in the space age. The investments we've made in our space program have paid off many times over in new technologies and even whole new industries. The space shuttles will be retired in 2010--this is a good thing since they're based on a design from the 1970s and much of their technology goes back 30-plus years (of course many systems have been updated). The very bad aspect of retiring the shuttle is the fact that our next generation spacecraft is not yet ready, and won't be until at least 2015. This puts a planned gap in our human space flight program. If we can spend and commit trillions of dollars on a poorly thought out war in Iraq, we can afford the relatively paltry sum required to keep our space program alive, strong, and moving forward. Spending money on a failed war is just a huge wasteful expense. Spending money on space exploration is an investment. As Americans, we need to understand the difference. On Mark's mission he delivered a lab called Kibo to the International Space Station. Kibo means hope in Japanese. I hope we will jump start our space program and remain leaders in the exploration of other worlds.